Since I was a small child, I always dreamed of the Amazon. I was an avid reptile fan, and according to my childhood books, all of the coolest snakes and lizards lived in the Amazon. It has always been the place I most wanted to go in the world. My mother even painted a huge mural on the wall of my bedroom, which features, among other things, an anaconda swallowing a caiman, a tree python, and a black jaguar. If you read the About — Hitchhiking page, you’ll see that it was always my goal to go to the Amazon. To put it simply, this is the adult me living out my childhood fantasies. By paddling, I accomplish a variety of things. I am able to get to know the river in the most intimate way possible. I travel very slowly; for example, in order to advance 100 kilometers up the river, I need to dedicate anywhere between four and six days of my life. During this time I will see many things that I would not have seen had I bought a motor for my canoe and done the trip in one single day. By paddling, and consequently, taking much longer to move around, I am limited to the amount of “dry foods” I can take along. Therefore I am forced to learn to live off the land by hunting and fishing. These are not the worst things one could be forced to do, and in fact, they are some of the parts of my river days that I most enjoy. Since I paddle, I can meet more river folk, who, in the Amazon, are some of the most selfless, accommodating people you will ever meet. I stop in nearly every village, and apart from just making friends, I learn new skills that help me in future trips. How do you manage to survive? Fishing in the Amazon is not hard. Essential equipment is nets, hooks, and line. (see the Gear List) As of yet, I have never felt serious pangs of hunger. I also bring plenty of rice, pasta, oil, salt, and beans. I take a good long look at Google Earth beforehand, and grill every person I meet while paddling about the area I am headed. Sometimes, if it is a trip that takes me to particularly isolated areas, I will print something off the Internet. I also have several compasses and a good sense of direction — though anyone who has ever seriously visited the Amazon knows the latter doesn’t do you much good when you’re off the river and in the jungle. Have you ever been horribly sick? No. Knock on wood. Occasional sore throats is all. I drink straight from the river. Contrary to popular belief, the Amazon has some of the cleanest water in the world. I also carry chlorine drops — just in case. And I don’t get the shits any more often than your average person. Really, dangerous animals are the least of your worries in the Amazon. In two years I have only seen one wild jaguar and two anacondas. Your biggest concerns should be keeping any wounds clean so they do not fester (which they do in the staggering majority of the cases) and watching your step. Venomous snakes, spiders, scorpions, and stingrays are much more dangerous than jaguars and anacondas. I want to do something like this! How? 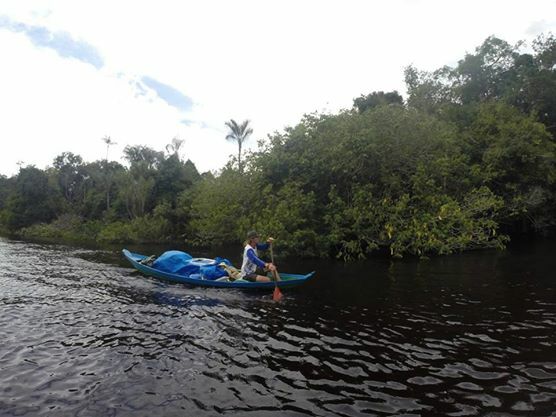 Come to the Amazon, buy a canoe, and start paddling. The rest will follow. If I am unoccupied, you can also spend a few weeks on the river with me. Email me to see if my back seat is open.